just got 2 new VL12 turntables and noticed that the tonearm bearing is quite stiff on both of them. 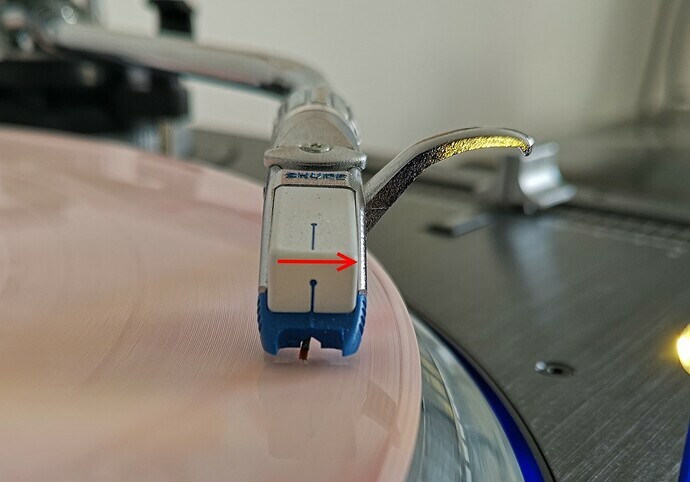 The issue is that the tonearm appears to be being pulled outwards and the needle is skipping. This is happening only in the first third of the vinyl track and then it settles and stops being pulled outwards. Did I not set something up properly? Anti-skipping dial does not appear to affect this. Cartridges are Shure Whitelabel. Weight is as per Shure instruction set @ 3.5g. I even have a cartridge scale to check the weight. See attached photo where you can clearly see the needle being pulled outwards.! Your help and tips will be greatly appreciated!!! Find a blank record side and report back on what the antiskate is doing. Hi! Thank you for the reply. I’ve checked all my records before and don’t have any blank ones. What is the difference between blank and non-blank (apart from no recording itself)? Should I look and try to buy an empty record? I don’t know if you can see the attached photo of the needle being pulled outwards. Anti-skate does absolutely nothing to this issue. The needle is still being pulled out even if I set it to max. I can’t seem to open your image. An outward force towards the beginning of the record is what the anti-skate causes. An inward force towards the end of the record and spindle is what the normal playing forces in the groove with an S tonearm cause minus the anti-skate force and this increases with downforce. You need a blank side or at least a substantially-large band in order to marginally set anti-skate. The end of a record with wide spaces between the groove might be sufficient to at least make sure the anti-skates are both functioning at all. Try setting the needle between the gooves and see if it moves inward to catch the groove, outward, or stays about where it is and the groove finds the needle as it rotates depending on the anti-skate setting. There’s no perfect anti-skate setting since it will overdo it towards one end of the record and underdo on the other… unless you’ve got an exotic turntable with a completely different anti-skate mechanism like some old Sonys. The higher your anti-skate setting for a given downforce, the less likely the record will skip forward in normal play and the potentially lower the intermodulation distortion (requires a test tone track to be sure on that second issue), but the more likely it will skip backward when you rotate the record in reverse. Shure Whitelabel tips were also notorious for having poorly-aligned cantilevers and very mushy lateral compliance, so it’s hard to know just from your description what’s going on. I can’t say what’s causing that without seeing it in motion and/or with the needle off the record. It could hypothetically be malfunctioning antiskate by being too strong and not actually affected by the dial, but that’s one of many possibilities. Try what I recommended in the other posts and report back. I’ll try to do what you said when I find an empty vinyl record. One more thing, if I compare the stiffness of the tonearm to my old Technics 1200 then the VL12 is way too stiff when travelling along the record. You can feel it resisting to being pushed towards the spindle. Same thing on both VL12s. One of them is now at Denon being repaired. The other one is being shipped to another DJ shop for repairs too. They said that it is not right that I feel resistance. So weird that both turntables have the same issue. That’s video is pretty useless without me seeing it move on a blank section. If you balance the tonearm and let it float, you might be able to see if the antiskate is doing something it shouldn’t even when it’s dialed to zero. Agreed, but that needle goes way bad here! Never have seen that kind of force. I assume it’s being pushed to the side, but I’ve seen enough WL tips that were already like that to begin with. One of the reasons Shure stopped making catridges: their quality control went down the toilet. Yes it was being pushed to one side. It’s a straight needle. The geometry of the tonearm couldn’t cause that, and really not even the bearings. It would seem then like a defective, overly-aggressive and non-adjustable antiskate mechanism on your turntables. Hello, I recently purchased a vl12 and i also have a skipping problem. Sometimes in the middléof a track àd sometimes towards the end of the vinyl. Highly annoying! Have you found a solution yet? If so, please let me know! Thanks!